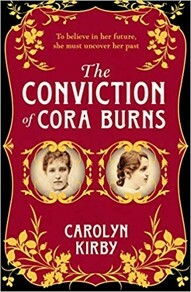 The Conviction of Cora Burns should make a prize shortlist or two, being a thumpingly good read. Kirby’s debut is a Victorian mystery which brings you ‘Sarah Waters’ without the lesbianism, Wilkie Collins brought up to date. 19-year-old Cora is a really troubled heroine, having been brought up without a family in a series of inhumane institutions. She knows she was party to a hideous crime a decade earlier, but she’s hazy on the details; she was, after all, only nine. What did she do? Was she the guilty one or was it somebody else? Carolyn Kirby drops the usual mystery schema: instead of having her investigator always one step ahead of the reader, Kirby scatters revelations that Cora never sees and lets the reader connect the dots. Thus, we have an advantage over Cora and two pre-Freud, pre-Jung social scientists, Jerwood and Farley, who work separately on different and bizarre theories of criminality. Who will come up with the right answer? Will they meet or might their paths have already crossed? This book has a strong and convincing Victorian flavour without drowning in research. It belts along, enlivened with pastiches of diaries and scientific papers, pushing ever onward to a surprising gothic climax and an unexpected diminuendo.